New for 2018 is a Solos Cyprus golf holiday with a wonderful twist! 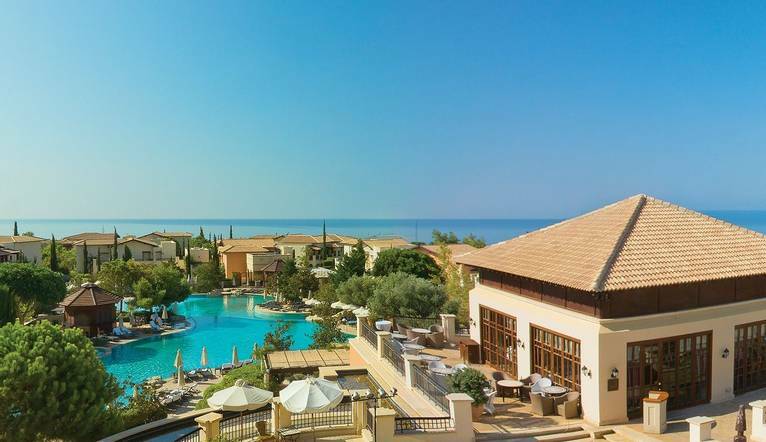 Join us at the fabulous 5-star Aphrodite Hills for a week of golf and sun where can enjoy 5 rounds of included golf on 4 world-class golf courses in the surrounding area. These courses include: the Secret Valley, Elea Estate, Minthis Hills and of course, the ever-popular Aphrodite Hills. Join us as we return to the 5 star Aphrodite Hills for another fantastic golfing week! Our stay includes five rounds of organised, friendly competitions on 4 world-class courses in the local area. We are sure this wonderful resort, which was refurbished in 2015 will provide a wonderful base for this holiday, and your stay includes drinks at the hotel in the evening, so we are sure there will be some fun, social post-golf debates to enjoy. Designed by the legendary Sir Nick Faldo this course offers world-class golf in a stunning setting overlooking the Mediterranean – it is fast becoming the ‘must play’ golf courses in Cyprus! Opened in 1996 the Secret Valley Golf Course is known as one of the best courses on Cyprus and is surrounded by stunning views. The par 71 will test all golfers with its testing fairways and unforgiving hazards, plus the tee positions can catch the most strategic of golfers out! Minthis Hills (formally known as Tsada Golf) is set in the beautiful hills of Tsada. Originally designed by Donald Steel it has later been renovated by Mackenzie and Ebert in 2006 and 2007. Despite it not being the longest golf course there really are plenty of opportunity that will really test our golf skills! The resort sits in a spectacular coastal location in an area of outstanding natural beauty. This luxurious hotel is renowned for its’ superb range of facilities, from the spa, sauna and gym to horse-riding, tennis, cycling and volleyball. There is also a fine range of restaurants and bars. Cyprus is an island steeped in history and culture, dating back thousands of years, so if you wish to venture further afield, there is plenty to see and do. The ancient Kourion amphitheatre is nearby, now fully restored and housing a fascinating museum. Visit the charming, traditional village of Omodos in the Troodos Mountains, with its winding streets and whitewashed tavernas. Alternatively the lively and cosmopolitan city of Limassol is nearby, with numerous shops, cafés, bars and nightclubs. The luxurious Aphrodite Hills Hotel is uniquely located on a plateau overlooking the legendary birthplace of Aphrodite in the Mediterranean Sea. Facilities include 2 restaurants and several bars, 2 swimming pools, tennis courts, a 24 hour health club, gym and a business centre. The highly rated Retreat Spa offers a wide variety of treatments (extra charges may apply to some facilities). There are free Wi-Fi zones available in the resort. Deluxe rooms feature air-conditioning, satellite TV, minibar, hairdryer, safe, tea/coffee-making facilities, a bathrobe and balcony with a pool or garden view. The transfer time from Paphos Airport to the Aphrodite Hills is approximately 15 minutes and from Larnaca is around 75 minutes depending on weather and traffic. A full 10-year passport is required, valid for at least the intended length of stay. Holders of British passports do not require visas.